Legend has it that the board game Go was used to train future leaders in the hopes that it would aid them in the struggle for control of a fragmented China. Had it been around, Eternal Dynasty might have been a better simulation of the trials they would soon face. Playing it just seems so much like preserving an empire that is constantly under attack. Here's what I mean. 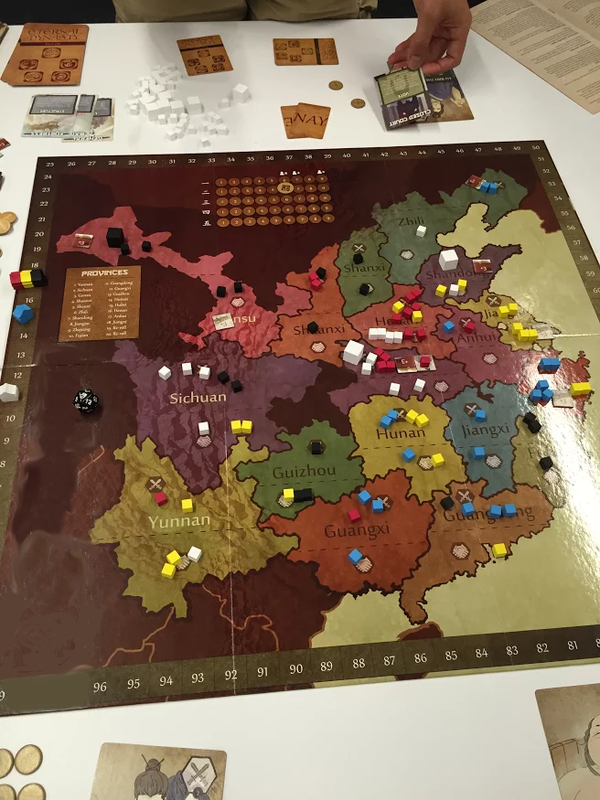 Eternal Dynasty is a game of area control, where everyone is a clan trying to control as many of China's provinces as they can. You are rewarded with Victory Points for having the most Military or Political Influence in a province, represented by cubes on the board. The game takes place over Generations, which are essentially rounds. However, you get a different clan leader every generation with a different power. Mid-game. I'm playing as Black. So basically in order to win you have to control provinces, build Palaces and Castles to make them worth more points, and then hang on to them as long as possible while also trying to expand into others' territory. You only have one action per turn, though. If the game's system ended right there, that would already be a good game. 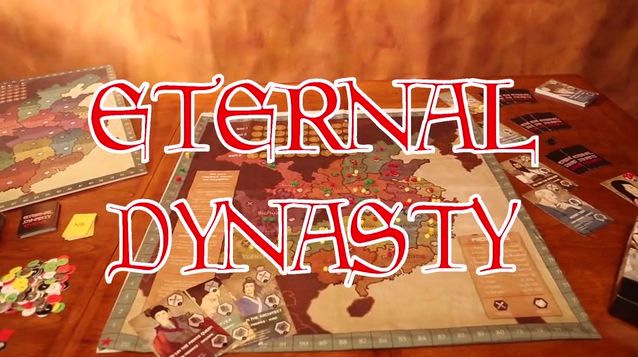 However, Eternal Dynasty keeps going and adds on tons of different systems. This ultimately makes the game feel very underwhelming. The classic area control games (think Diplomacy or Risk) had really simple rules, because they were all about the politics. The choices you could make in them felt unlimited because you were dealing with people, not rules - you could make any deal you wanted, backstab your allies, and keep playing. Not so with Eternal Dynasty. There are so many things to do, and sadly most of them seem geared toward forcing player-to-player interactions that the classics would have left unsaid. Remember, you only have one action per turn. But during any particular turn in the game, you might have to choose your Dynasty cards (they count as an action and are typically very powerful), choose your Leader for that generation, use a Vote card that will change Influences drastically, use your ruler's power, place 1 of 2 types of influences in any of the 18 different provinces, play a Dynasty card, win coins that have a range from 0-2 VP, or check the random event that happens once per generation. The end result? There's an interesting eurogame buried deep within all of these choices that seem bent on forcing you deal with other players in a direct way. Ultimately the game feels too cluttered making it a "try before you buy". If you like the Chinese theme and enjoy strategy while still planning for random events, then you'll like Eternal Dynasty. Otherwise, you'll be pretty angry at the guy who foiled your generations-long plan by playing one card.